Note: This article was originally published in the January 2008 issue of the Denver publication Community News. Basic recipe: In a colander, rinse and drain two 15-oz. cans of garbanzo beans (chick peas). 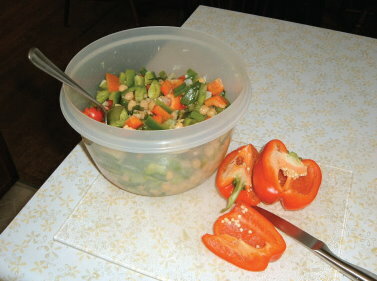 Rinse, seed, and chop 1 large green bell pepper and 1 large red bell pepper. In a bowl, mix the beans and peppers. Season to taste with small amounts of olive oil and apple cider vinegar (or lemon juice), plus seasoned salt and black pepper, then stir well. Optional: Add one 7.5-oz. jar of Reese marinated artichoke hearts, cut a bit smaller. Some of the marinade from the jar is also tasty in the mixture. Spread the mixture in a shallow serving dish and garnish the edges with 4 hardboiled eggs cut into wedges (quartered lengthwise). Sprinkle the eggs with salt and pepper. Chill the mixture for at least 2-3 hours before serving. Variations: Add a few chopped green onions. Use more peppers if desired; a yellow one is pretty, too. If you like, first line the serving dish with rinsed romaine lettuce leaves; that adds more green and nutrition. 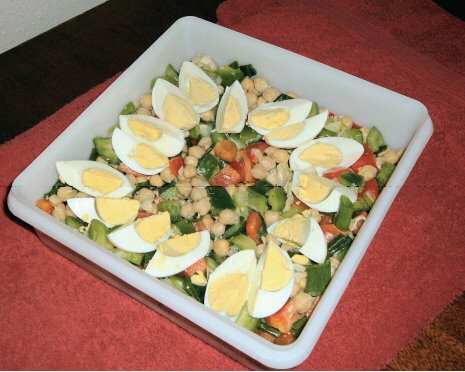 This serves 6 or more as a side dish or appetizer. If you mix in at least 1 cup of chopped, cooked chicken or turkey, it serves about 4 as a main dish. Add a dinner roll or a piece of garlic bread, and you have a complete, healthy meal. This benefit to babies has been all over the news, but it's worth repeating here. My only child is now 38, but I remember the months that I breastfed him as one of the most joyful and satisfying parts of being a new mother. Now, given this fascinating news, I'm gladder than ever that I had both the ability and time to breastfeed him. Need another reason to try to quit smoking? How about this shocker? For many of us, health issues of middle and old age now loom large. I had breast cancer and a left-side mastectomy in 1998, and later wrote a book about that life-changing experience. (See Another Chance at Life: A Breast Cancer Survivor's Journey.) I didn't want breast reconstruction, and am happy wearing a silicone-filled breast prosthesis (breast form) in a mastectomy bra. At a local store, I paid over $300 for my first Amoena prosthesis and over $40 each for my first mastectomy bras. Thus I was thrilled to discover the online medical supply site Metro Medical Online. They offer home medical products in 27 categories, including diabetic, incontinence, mastectomy, maternity, and pediatric supplies, even wheelchairs. The range is amazing and the service is fast. You can also reach them toll-free at 1-866-774-9513. They carry numerous high-quality Amoena bras and breast forms at roughly 15-30% less than what you would pay in stores. I can personally recommend the Amoena breast forms Tria Aire 442 ($174) and the Luxa Lite 661 ($227). Much less expensive, fabric-filled "leisure" forms are also available. A very comfortable mastectomy bra is the Amoena "Annabell" style, #2126, just $34, or 2 for $61.20. The shimmery "Pearl Beige" is gorgeous. If you need home medical products, I hope you'll give these folks a try.